Unit operates at 4,000, 9,000, and 18,000 BTU/Hr. Features on unit include automatic low oxygen shutoff system and accidental tip-oversafety shutoff. 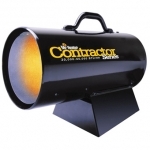 Heater is designed and approved for emergency indoor and outdoor use. Connects directly to two-1 lb. disposable cylinder or to a 20 lb. cylinder with Mr. Heater's F273701 hose (059-05441). 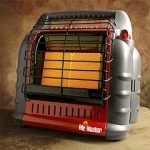 Typical uses include cabins, RV's, picnics, tailgate parties, workshops, and emergency heat. Not designed for permanent installation. CSA certified. Heats approximately 1750 sq. feet. Runs up to 11 hours on full tank. 6 gallon fuel tank. Overheat safety shutoff. Continuous ignition. Thermostat and illuminated on/off switch. Trouble shooting diagnostics with LED indicator. Mr Heater Contractor LP Forced Air Heater 60K BTU. LP Gas Forced Air Heater MH60 FAV 30,000 - 60,000 Btu/hr. Features include: Heats approximately 1250 sq.ft. ; Runs up to 14 hours on a 20lb tank (low setting); High temperature limit switch; Continuous ignition; 10ft hose and regulator included; CSA certified. Typical uses include construction sites, patios, factories, sporting events, utility buildings and barns. 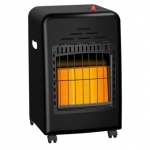 LP Gas Cabinet Heater MH18CH - 6,000-18,000 Btu/hr. Features include: Hi-med-low settings; Automatic low oxygen shutoff system; No electricity required; Operates on a standard 20lb cylinder; CSA certified. Typical uses include patios, decks and construction sites.